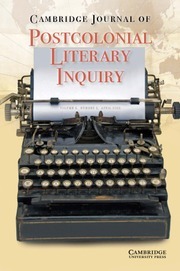 The Cambridge Journal of Postcolonial Literary Inquiry is a new peer-review journal that aims to deepen our grasp of postcolonial literary history, while enabling us to stay comprehensively informed of all critical developments in the field. The journal provides a forum for publishing research covering the full spectrum of postcolonial critical readings and approaches, whether these center on established or lesser known postcolonial writers or draw upon fields such as Modernism, Medievalism, Shakespeare and Victorian Studies that have hitherto not been considered central to postcolonial literary studies, yet have generated some of the best insights on postcolonialism. The journal aims to be critically robust, historically nuanced, and will put the broadly defined areas of literature and aesthetics at the center of postcolonial exploration and critique.